Breakfast is definitely a place of nightmares for a busy mom of a picky eater. We are solidly in the toddler-zone in my house. That means what was acceptable yesterday is not ok today. My little picky eater loves waffles but I hate to clean them up. So I created this recipe that I can prep the whole batch at once and then freeze the leftovers. This recipe includes 2 sweet potatoes, or about 2 cups of sweet potato puree. You can prep your sweet potatoes whatever way you prefer, but I prefer the quickest way possible. That means that I prep them in the microwave. 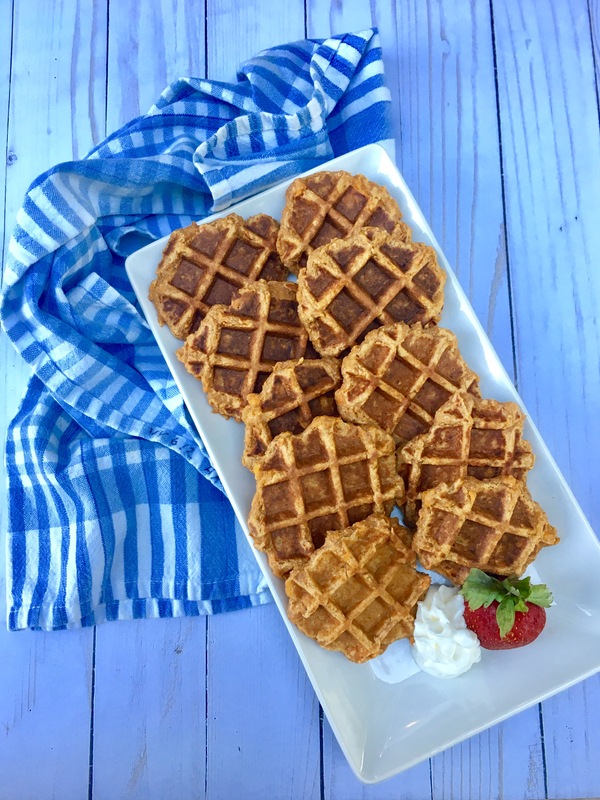 These waffles also have no added sugar and lots of fiber with oat flour and whole wheat flour! This batter is really thick, so I recommend that you spray your waffle iron and only put a thin layer of batter in the waffle iron at a time to make sure they cook all the way through. Tip: Make your own oat flour by pulsing old fashioned oats in a blender or a food processor. Poke sweet potatoes with fork and place in microwave for 5-8 minutes or until tender. Allow to cool and cut in half. Scoop out "meat" of sweet potato and place in a medium bowl. Blend with hand mixer, or mix with a fork until smooth. Add milk, oil, maple syrup and egg to sweet potatoes and mix well. In a separate bowl combine flours, baking powder, cinnamon, and salt. Combine wet ingredients and dry ingredients and cook in waffle iron.